911 Restoration Charlotte assures the homeowners in Davidson will receive quality water damage repair and restoration whenever leaks start becoming a major concern. When faced with an issue pipe bursts, sewage spills, or flooding, you can count on our water damage Davidson technicians to take on your water woes with the best solutions. If you’re looking for a fresh start, 911 Restoration is the company you can always turn to. Our licensed, insured, and bonded experts will take on even the worst emergencies like flooding and storm damage. When the roof springs a leak, let us work on the problem right away. To restore your home as soon as possible, you can expect our mold removal Davidson technicians to be there within 45 minutes of your emergency call to check for damage and any signs of fungal infestations. We will be available 24/7/365 to offer assistance any time you need leaks of any kind repaired and water extracted. So even at the crack of dawn or in the middle of the night, our water damage Davidson team will always be ready to provide the restorations that will give your home a fresh start! With over three decades worth of experience in working on various water-related problems, we know how to repair and prevent leaks from harming your home. Make sure you check your roof for any signs of damage like missing or curling shingles. Repairing these issues early on can help you in preventing roof leaks from occurring. Leaks and floods can lead to moisture buildup which can create the ideal environment for mold to thrive. 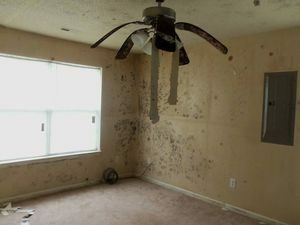 Our mold removal Davidson specialists will make sure that the affected areas are thoroughly inspected and any signs of mold growth are removed from your property. For effective and thorough repairs and restorations, our IICRC certified water damage Davidson team will make use of state-of the-art drying tools and techniques to remove water and moisture so mold doesn’t start to take root. Whenever you need water emergencies like flooding or roof leaks repaired by professionals, you can always turn to the water damage Davidson team from 911 Restoration for assistance. Give us a call today!